Everything is More Fun When it’s Real! Dust off those boots, get outside and have some fun with a horse. You could win some great prizes for doing just that. We want you to spend less time in front of the TV and computer and spend more time outside and being active. Less screen time and more horse time equals great prizes, it’s that easy! This creative program has stirred up a lot of interest and enthusiasm over the years. Alberta Equestrian Federation (AEF) members from all over Alberta aged 7-15 are leaving the TV and computer behind and getting out and spending more time with their horse. Not surprisingly we receive a lot of support from parents too! Youth members keep track of how they are spending their time each year from April 1st until September 30th of each year and win great prizes. You don’t even have to own a horse to participate, and best of all it’s FREE to join in on the fun ! Youth members ages 7-15 years old need to select the ‘Live Outside the Box’ option on their membership form/or through the online membership walk-through process. A confirmation email will be sent to all those whom select this option during their membership renewal and a request to confirm program enrollment email will be sent in follow up. Upon confirmation of enrollment being received, each confirmed participant will be mailed a log book and custom program zipper pull. Track and submit your daily hours/servings in the log book provided to you for each month (April – September). After the end of each month log into your AEF profile online submit your totals for the month. 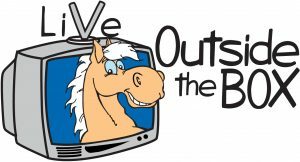 Please note: Registration for the 2019 Live Outside the Box Program is currently closed. Thank you to those who registered. We look forward to following your adventures for the next several months – Good luck! In addition to the grand prizes, the AEF is also excited to be able to offer six monthly draws for an awesome prize (rewarded each month) for those who continually submit their hours throughout the duration of the program. Participants are automatically entered into the monthly draws as long as they submit their hours and a photo of themselves with their equine friends, before the mentioned deadline. Note: Each participant is eligible to be a grand prize recipient twice ever (excluding monthly draws). Prizes may change without notice.